District involves educators, parents, institutions of higher education, and other community members in actively improving the district and campus cultures, practices, and systems. Family, community, and educator involvement is an essential strategy for improving student outcomes in districts (Weiss, Lopez, & Rosenberg, 2010). 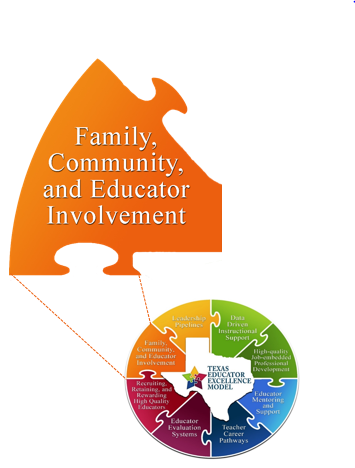 To be effective, family and community engagement must be systemic, integrated, and sustained throughout the district and schools (Weiss, Lopez, & Rosenberg, 2010). These engagements are a shared responsibility between schools and districts with the family and community, and they should be a continuous process throughout a student’s journey through the system (Weiss, Lopez, & Rosenberg, 2010). Working with institutions of higher education leads to building new strategies that improve district and campus cultures, practices, and systems. Serve as a thought partner to develop research-based systems to increase stakeholder engagement. Assist with designing content or organizing stakeholder group meetings focused on the development of systems or sharing of information.